Loes Derikx left the ORL November 1st 2016. Click her LinkedIn tag. To Thesis: Femoral Fracture Risk Prediction in Metastatic Bone disease. I studied Biomedical Sciences, with a focus on Clinical Human Movement Sciences during my Master’s. I did my minor internship at the Orthopaedic Research Laboratory, and my final internship at the FC Donders Centre for Cognitive Neuroimaging in Nijmegen. In December 2008 I started my Ph.D. research at the ORL. In metastatic bone disease, primary tumour cells have spread throughout the body and have developed into metastases, most often in the axial skeleton and the long bones. These metastases considerably increase the risk of a pathological fracture, in which case acute surgical treatment is needed, followed by a long and intensive period of rehabilitation. Treatment plans for patients suffering metastatic bone disease are therefore based on the risk of fracture. Metastases causing a low risk of fracture are treated palliatively, whereas high risk metastases require prophylactic stabilization of the femur in order to prevent fractures. However, in clinical practice, the discrimination between those risk categories has shown to be difficult. Therefore, the aim of our research project is to develop a finite element model that improves the prediction of the femoral fracture risk in order to optimize the treatment of patients with metastatic bone disease. 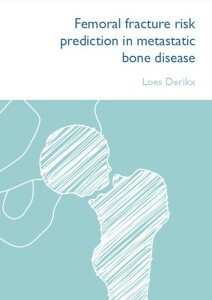 My Thesis: Femoral Fracture Risk Prediction in Metastatic Bone Disease.